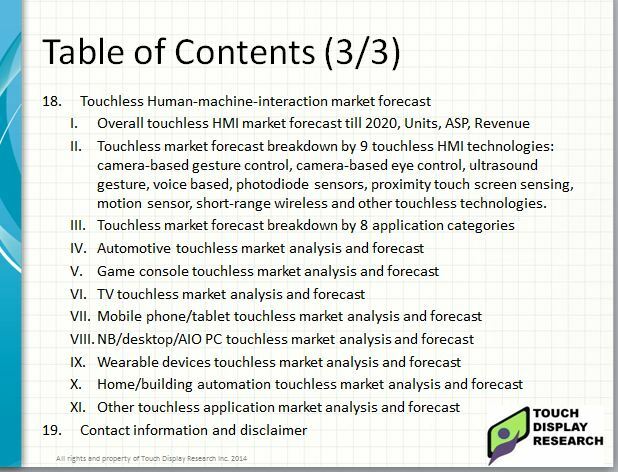 Report: Gesture Control, Voice Recognition, Eye Tracking, Motion Sensor, Proximity Touch Market Forecasted to Reach $42.6 Billion by 2020 - Touch Display Research, Inc.
Santa Clara, September 24, 2014— In the recently published “Touchless Human-Machine-Interaction Market Report”, Touch Display Research Inc., an independent market research and consulting firm, analyzes over nine touchless HMI technologies, and eight market applications. Touch Display Research forecasts the touchless HMI market will reach $42.6 Billion by 2020. Gesture control, voice recognition, eye tracking, proximity touch, and motion sensors have gained momentum in the past few years. Apple, Google, Microsoft, Amazon, Samsung, LG, Intel and Qualcomm are all working on touchless HMI. They’ve acquired or will acquire small companies with touchless technologies. “From mobile phones to automobiles, from digital signage to home/building automation, from notebook PC to wearable devices, touchless human-machine-interaction is the next big thing. Touchless HMI provides the benefit of hygiene/cleanness, safety, power/resource saving, convenience, fun, and coolness. 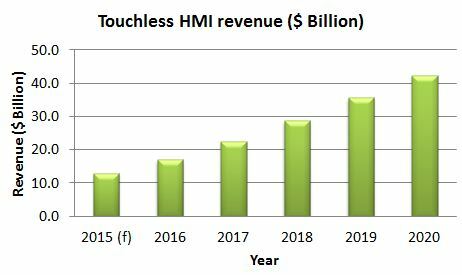 We forecast touchless HMI market will grow rapidly in the next several years,” said Dr. Jennifer Colegrove, Principal Analyst at Touch Display Research. 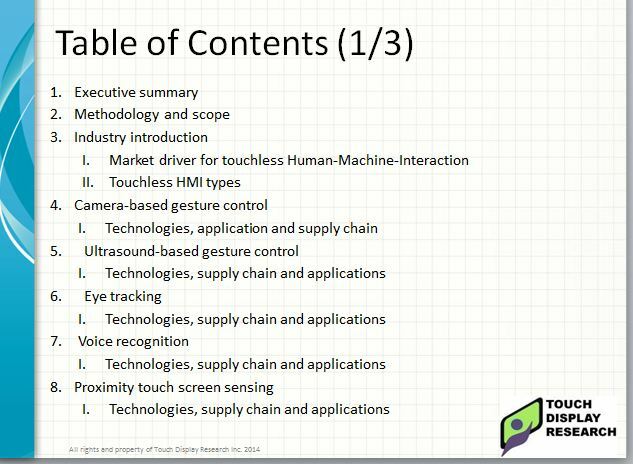 • This report provides analysis of nine touchless HMI technology categories in eight application categories: automotive, game console, TV, mobile phone/tablet, NB/desktop/AIO PC, wearable device, home/building automation, and other applications. • Dr. Colegrove, author of this report, has been writing about gesture control, voice recognition for several years. She performed first hand surveys and interviews with many sensor suppliers and OEM/ODMs. • Market data in the report includes 2013 history data and forecasts from 2014 to 2020. • The market forecast includes Unit, touchless solution ASP, Revenue, with detail breakdown by nine touchless technologies: camera-based gesture control, camera-based eye tracking, ultrasound gesture, voice recognition, photodiode sensors, proximity touch screen, motion sensor, short-range wireless and other touchless technologies. Over 200 touchless sensor, touchless software, system integrators and brand companies are profiled in the Excel database. The USA is the most active country in the touchless HMI market with 96 companies. Japan is No. 2, Germany is No. 3. Source: Touch Display Research, Touchless HMI 2014 report. The “Touchless HMI 2014 Report” is available immediately and includes a PowerPoint file of over 240 pages and an Excel database. 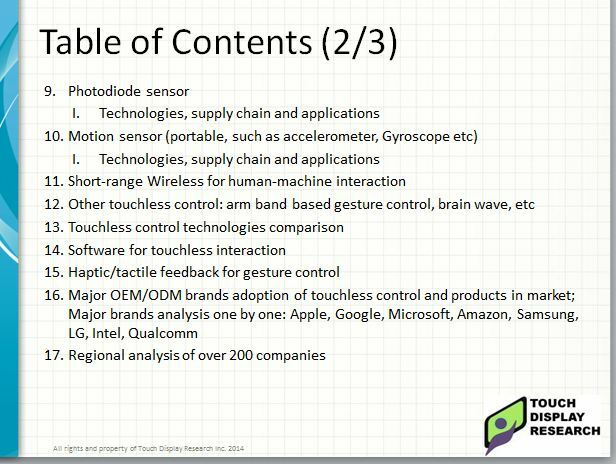 • Touch Display Research experts have been writing gesture control, voice recognition, eye tracking, proximity touch analysis reports for over seven years. You can access this expertise by purchasing and receiving the report today. A license for less than five users is $5900 for this report. The license for five or more users is $6900. Touch Display Research, Inc. is an independent technology market research and consulting firm specializing in touch screen and emerging display technologies such as OLED displays, OLED lighting, flexible displays, e-paper displays, ITO-replacement, 3D displays, near-eye displays, pocket projectors, quantum dots, gesture controls, voice controls, and eye controls. Touch Display Research provides standard reports, consulting projects, and due diligence for touch suppliers, display manufacturers, consumer electronics ODMs/OEMs, material suppliers, investor companies, venture capitalists, and companies who are merging or acquiring companies in the touch screen, display, and materials industry. We are Silver Corporate member of SID (Society for Information Display). We are member of Flextech Alliance. Our website is TouchDisplayResearch.com.